Pre-game Rituals And Superstitions May Not Help You Become A Better Player, But Why Take Chances? Left shin pad, left stocking. Right shin pad, right stocking. with the right side tucked into his pants. Wayne Gretzky dressed himself the exact same way throughout his Hall of Fame career. Did it have anything to do with him becoming the NHL’s all-time scoring champion? Probably not, but it did put him in the right frame of mind before stepping onto the ice, where even the greatest player in the game can’t control everything. 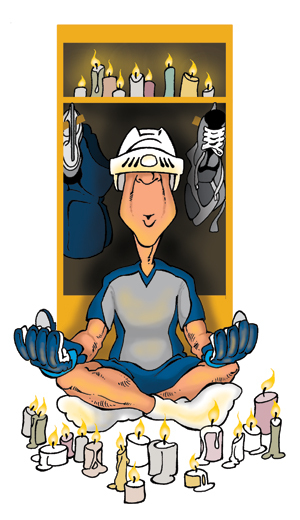 Pregame rituals or superstitions usually begin innocently enough, with a player linking an on-ice success to a totally unrelated moment before a game. Before long, those same rituals or superstitions tend to morph into something a player simply cannot live without. “I was awful,” goaltender-turned-broadcaster Darren Pang admitted on ESPN.com. “I found the pressure was just incredible, especially playing at home in Chicago. I would go through the morning skate and everything was fine. I’d get back to the house for lunch and take a nap. The minute I woke up from my nap I was so narrow-minded, no one would talk to me. Peter Haberl, a sports psychologist with the United States Olympic Committee who has worked with the men’s and women’s Olympic hockey teams, makes a clear distinction between rituals and superstitions. Rituals become part of a routine, and an athlete has complete control over them. Superstitions, on the other hand, might actually get in the way of performance, because athletes cannot control them. “When it’s part of the routine, it helps you focus on the task at hand and gives you a sense of control, and it often adds confidence,” Haberl said. The routine might include a breakfast of oatmeal, toast and a glass of milk at the same time every game day. Or a plate of spaghetti exactly four hours before game time. Or a cup of tea for relaxation. For Freddy Meyer, a National Team Development Program graduate now with the NHL’s New York Islanders, the routine begins as soon as his alarm clock rings after a good night of sleep. From that moment until the drop of the puck later that evening, he focuses on his performance. Mark Stuart, an NTDP alum now with the Boston Bruins, prepares himself mentally as well as performing the ritual of putting his equipment on the same way each game. Hall of Fame goaltender Patrick Roy meticulously placed each piece of his equipment on the dressing room floor before strapping it on in exactly the same order each game. Most players tape their sticks in the same pattern or rely on a “lucky” T-shirt, no matter how bad it smells or how ratty it looks. That’s where rituals can cross the line into superstition. Chris Chelios has worn the same pads for decades and insists on being the last player in the dressing room to pull his jersey on. “A superstition can take away from that focus, especially if it’s not there,” Haberl said. “If you believe you play your best when you’re wearing your red socks, what happens when you forget them for one game? It takes away from your focus because you have a prophecy that something bad will happen during the game. Or, if two players have the same superstition of being the first one out of the locker room, you’re going to have a mad dash to the door, and that could cause problems. When a superstition gets out of hand, Haberl simply appeals to an athlete’s logical side. The key seems to be moderation. “I spent time with the B.U. [ice] hockey team, and they had a goalie with so many superstitions that he spent most of his time checking to see if he’d done all his routines, and if he had all his good luck charms in place,” Zaichkowsky recalled, laughing.